Designed for modern living, Cambria at Clarkson offers the perfect combination of connectivity and choice, without the compromise. A stone’s throw from the pristine coastline, Cambria offers a rare opportunity for first homebuyers, downsizers or investors to embrace coastal living at an affordable price. “With the Mindarie Marina and the beautiful patrolled swimming beach at Quinns Rocks just a five minute drive away, there are very few locations in WA where you can live so close to attractions like these for under $300,000,” Now Living Realty manager Dave Gillon said. With construction already underway, this architecturally designed apartment building will feature 13 beautifully finished apartments across two levels, as well as a fully landscaped common area for residents to enjoy. This secure complex will include a choice of 1 and 2 bedroom apartments all with underground parking and an outdoor living space. Ranging from 50m2 to 81m2 these apartments offer the ultimate low maintenance, lock-up and leave living solution. “Working with architects from MJA Studio has allowed us to create a very modern and highly functional project, which will prove to be a place to live. Now Living Executive General Manager Troy Gorton said. Located a few minutes walk to Clarkson train station, Cambria offers easy access to the Perth CBD. And with beaches, parks, Mindarie Marina and Ocean Keys shopping centre close by, this unique apartment development offers the ultimate lifestyle in the thriving suburb of Clarkson. The community will also benefit from enhanced connectivity with the recently completed Mitchell Freeway extension to Hester Avenue. “Although all of the apartments come with one or two car bays, a car will be optional when you can simply stroll to the train and travel 10 minutes to Joondalup and do all your shopping and entertaining before returning home on the train,” Now Living Realty Selling Agent Josef Schmidt said. 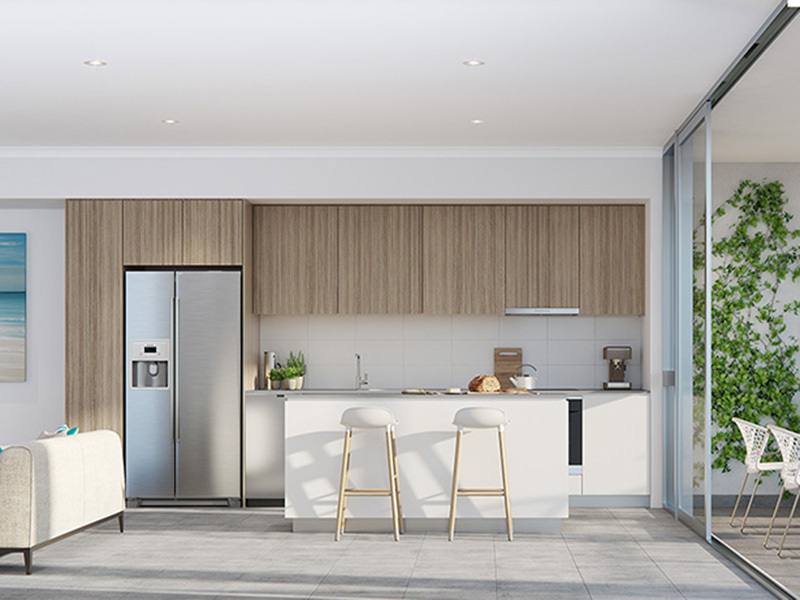 Each apartment includes high quality features such as stone benchtops, overhead cupboards, stainless steel appliances and air-conditioning to the main living area. Cambria is now selling, with prices starting from $279,000. Be quick to secure your spot in this boutique apartment complex today.